Gangstar Rio : City of Saints (v1.1.4) — Mobers.ORG — Your Daily Source For Mobile FUN! 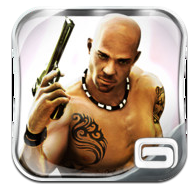 The acclaimed Gangstar series is back on iPhone and iPad to offer you a whole new place to have criminally good fun!You’ll never experience a better way to discover Rio de Janeiro! For the first time ever in a sandbox game, explore the city of Rio de Janeiro, Brazil. Discover 5 different neighborhoods including the favelas, business district, beaches and jungle. Also, for the first time in the Gangstar series, explore indoor environments fully realized in 3D. Over 60 varied missions to complete, plus dozens of random events to give you hours of fun. Kill corrupt politicians, protect witnesses, deliver special packages, steal cars and find out who tried to kill you and leave you for dead. Also drive dozens of vehicles including planes, helicopters and a tank, and of course, you can rob, purchase and collect dozens of cars or motorbikes.